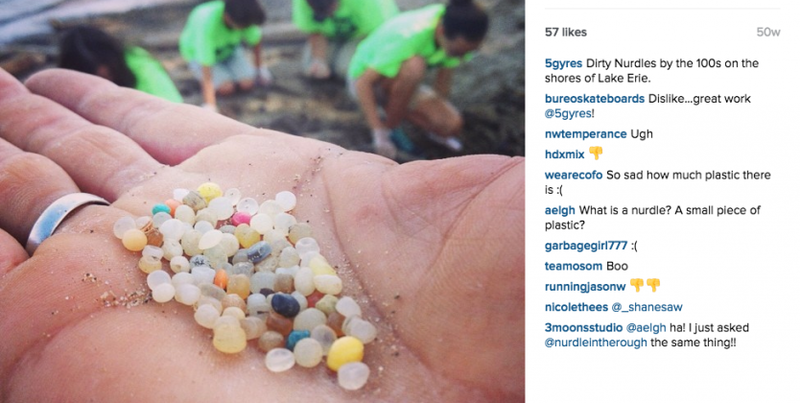 Either you’ve been hearing a lot about microplastics lately or you haven’t been paying attention. The minuscule byproducts from cosmetics and clothing are causing big problems for the environment. Here’s a quick overview of what they are, why they’re problematic and what the outdoor industry is doing to mitigate their effects. Microplastics are small plastic particles (generally between 1 and 5mm) that come from a wide variety of consumer products and sources, including cosmetics, clothing and industrial processes. Because of their size, microplastics can end up in waterways and marine ecosystems when clothing is washed or when cosmetic products are washed down the drain. There is some evidence to suggest that one source of microplastics may be microfibers (also called microplastic fibers), which enter waterways when polyester and acrylic garments are washed. Microplastics, including microfibers, are showing up in the environment at high levels, particularly in marine ecosystems. In 2008, UNESCO estimated that around 245 metric tons are produced per year. These plastic particles persist in marine ecosystems for many years and attract toxins like DDT and BPA, which are ingested by smaller marine life, moving up the food chain and then found in the tissues of larger organisms. Much of the environmental impacts and subsequent health effects of microplastics and microfibers are not yet completely understood, and research is currently underway to further investigate and better understand the impacts these may have on our ecosystems. What is the outdoor industry doing to address this? Since 2007, the OIA Sustainability Working Group has been working to address the environmental and social impacts of our global supply chains, utilizing a pre-competitive, collaborative model to convene industry stakeholders around important supply chain topics such as chemicals management, materials traceability and social responsibility. We are also now exploring the issue of microfiber pollution. This is an emerging issue; robust data around the environmental impacts and the potential role played by the apparel industry and other industries is scarce at present. Our first priority is to seek out more data, in order to clearly understand the impacts and identify our best leverage points as an industry. We need to know exactly what we’re up against and where it makes the most sense for us to engage – where we can have the greatest impact and where other industries or stakeholders may have an important role to play. We also need to identify practices that we can adopt and scale across an entire industry. And we need to balance this issue against the many others that are critical to our industry, like phasing out hazardous chemicals, or protecting labor rights and fair wages of all those involved in making our products, or ensuring the ethical sourcing of animal products such as wool, down and leather. In January 2015, Nicholas Mallos of the Ocean Conservancy spoke at the OIA Sustainability Insights Conference at Outdoor Retailer Winter Market. With over one hundred outdoor industry supply chain and sustainability leaders in the room, Nicholas provided an overview of some of the threats microplastics and microfibers pose to our ecosystems and discussed some of the research being done to better understand what industries can do to mitigate these impacts. As a follow-up to our in-person meetings and conference at Outdoor Retailer Winter Market, we will be hosting another discussion around microplastics and microfibers during the Sustainability Insights Conference at Outdoor Retailer Summer Market on August 4th. Representatives from Patagonia and the Hohenstein Institute will discuss some of the existing efforts and challenges, from identifying data gaps to exploring solutions with the appliance and washing machine industry, in order to further continue the conversation around how industry can most effectively address and mitigate microplastic pollution. Aligning with impartial, data-driven issue experts such as the Ocean Conservancy to help us better understand the impacts. Promoting awareness of this issue within the outdoor industry community. Identifying leverage points and convening an industry group to develop tools and resources around best practices. Attend the Sustainability Insights Conference on Tuesday, August 4th in Salt Lake City to hear more about existing work around microfibers and join in on the conversation on this issue as well as many others. Join the Sustainability Working Group to participate in the collective industry efforts around supply chain management and best practices. Contact us at sustainability@outdoorindustry.org for more information. **This article first appeared on the Outdoor Industry Association blog here. This entry was posted in Brands and tagged Microplastic, Ocean waste, oia, Supply Chain.